I’ve been using and loving thirty-one products for at least five years now, they’re perfect for staying organized during family travel. So when Christy Monfort, a thirty-one consultant, contacted me and asked if I’d like to do a thirty-one review during an upcoming trip, I said “ABSOLUTELY”! I have to admit when Christy recommended the Timeless Beauty Bag, I hadn’t even considered it as an option. Once I thought about it, I realized it would be a great product to try out and use for our upcoming road trip. We received a Turquoise Cross Pop and Pink Cross Pop Timeless Beauty Bag, one for each of my girls. The day the thirty-one box arrived, my girls were so excited to open it and find their new travel bags. How can you not get excited when that box with pretty pink writing arrives?! Days before we were to leave on our trip our girls had packed up and prepared their Timeless Beauty Travel Bags. The Timeless Beauty Bags are really great because they feature a clip buckle on one of the handles that allows the bag to be clipped to something. This feature is perfect if you’re using it as a makeup bag and want to fasten it over the shower or towel rod. It also makes it ideal for clipping in the car for a road trip. They have three zippered compartments (perfect for chapter books and notepads) and some elastic bands (for makeup brushes) that work great at holding pencils and markers. The girls had easy access to their books and pencils and our car stayed much more organized with this fun storage solution. 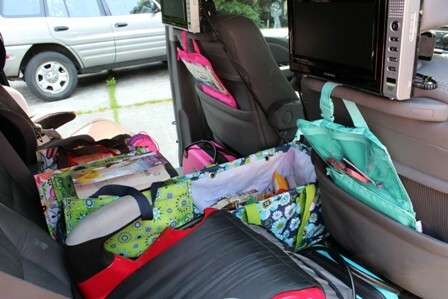 As you can see, we used a few other thirty-one gifts products during our road trip too. Did I mention that I’m a fan?! Each of the girls has a Keep-It Caddy that they use to store larger items like electronics and friendship bracelet stuff. The two bags fit perfectly next to each other in the middle seat of our Honda Odyssey. The Timeless Beauty Bags (I’d love to call them Timeless Travel Bags!) 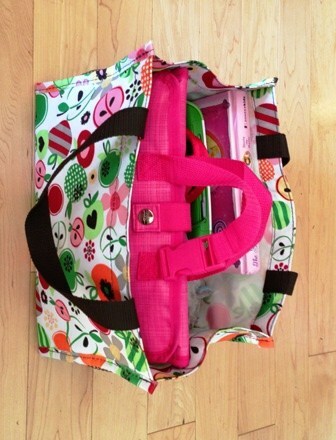 also fit very nicely inside our Thirty-one Keep-It Caddy totes. We also used a Large Utility Tote to store all our snack foods. This became a gathering spot for other stuff during our road trip, but so much better than having it strewn around the van floor! I really do love the thirty-one products and I’m so excited I get to host a giveaway with Christy. Below is a rafflecopter (might take a minute to load) where you can earn up to 10 entries to win your very own Personalized Thirty-One Timeless Beauty Bag! Check out Christy Monfort’s thirty-one website to see how you can organize your next family vacation. Disclosure: Christy provided the two Timeless Beauty Bags to our family for the purpose of this thirty-one review. All other thirty-one totes have been previously purchased by myself. I was not financially compensated for this post. The opinions are completely my own based on my experience. I love the name of your blog!! And I have never heard of this company..thanks for the giveaway!